Happy Thanksgiving (to everyone celebrating)! As you can see by the blog title, we’re almost at the one-year mark. I still can’t believe this whole thing started that long ago, because time has been flying by. Then again, time is a flat circle. So, who am I to try and make sense of it all? I’m sure everyone out there has a very busy day planned, but I did want to take a moment and thank every single one of you. I need to thank my friends, family and colleagues, who have supported me from the very beginning. As well as everyone I’ve met along the way; those who have helped make this project a true success. The individuals who continue to send me questions through the site and the people I interact with on a daily basis, both on- and off-line. There are so many of you out there who’ve helped make #TGAA both interesting and inspiring for everyone involved—especially me. Throughout the past year, I’ve made a lot of new friends and it’s been an absolute pleasure getting to know all of you. I can’t even begin to rattle off names, because I fear I’ll forget a few. So, before you sit down to Thanksgiving dinner or the day’s big football game, please take a moment and check out this page. It’s all of the great people, who have made this adventure…well… great. Have a wonderful day everyone! I’m off to wander around a bit, before I head over to Bluehour for my own little slice of the holidays. I’ll probably post a blog from the train this weekend too. So, stay tuned. P.S. — Be careful if you’re out shopping tomorrow. No deal is worth a broken leg. This place is absolutely stunning at night. No matter how many times I walk around the downtown area after sunset, I always find a wealth of new gorgeous neon signs and mesmerizing hilltop views. It’s almost as if a wonderful transformation takes place once you can no longer see the high-rises and skyscrapers. After the night sky consumes the tallest buildings and top floors, you’re left with streets lined with holiday lights; lampposts adorned with red ribbon and bows; and immaculately crafted storefront displays. That's why after two weeks, I still believe Portland truly is a small town masquerading as a big city. While I was saddened to learn that not many people reside in this beautiful downtown area, it does lead me into something else I’ve been meaning to write about. Over the past couple months I kept hearing that Portlandians are becoming more and more frustrated by the number of residential buildings being raised in the area. To me, this was all rather confusing, because I saw a lot more residential construction in Austin and Seattle. Thankfully, after asking around this weekend, I was finally able to shed some light on this common assumption. It turns out there’s an anger boiling under the surface, because many people feel all these new high-rises will eventually cause the city to lose that “small town” charm I was just talking about. Not to mention, it could lead to a massive rent increase. Honestly, I can’t say I blame them. The #1 trend I’ve seen amongst new buildings—from Boston and Charlotte to Austin and Seattle—is that they each feature all-glass façades, even if it doesn’t fit into the surrounding architecture. I’m not saying I’m an expert on any of this, but after traveling this long, it’s certainly noticeable and a tad bit alarming. One of the best parts of this entire trip is seeing how each city is different. Yet, if we continue to erect these cookie-cutters constructions, we’ll wind up stripping all of our homes of their individuality. And that would be a shame, if you ask me. I’m sure there’s an underlying story about citizen responsibility and local government participation here, but I’ll refrain from going off on a tangent today and just leave it at that. I know this is a topic I briefly touched upon back in March and to see the trend continue all the way across the country is a bummer. That's why I decided to bring it up. 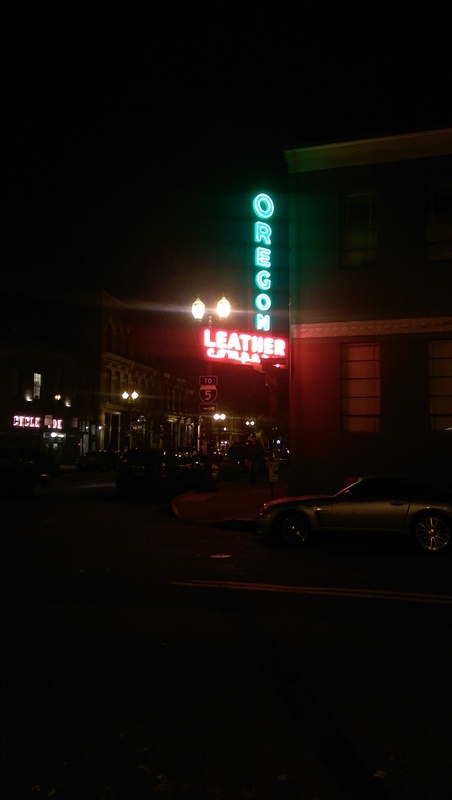 Aside from opinions on architecture and city planning, I also learned a few other things about Portland. I discovered that this city loves Chuck Palahniuk. How can I be so sure? Well, I ended up spending my entire Saturday afternoon inside Powell’s City of Books, just to get his signature. Granted, it’s an absolutely amazing bookstore and Chuck is one of my personal inspirations. But, by no means was I expecting to be waiting in line for 4+ hours. To put it into perspective—a Cavs game started when I first entered the line and ended 15 minutes before I secured said signature. For as frustrated as I was though, I couldn’t help but feel bad for Palahniuk. He ended up signing books for a total of 8 hours (that I know of). I applaud him for his dedication; that’s for sure. The final thing I learned is that Portland and snow do not mix. There was a light dusting of powder late last week and it basically shut the entire city down. It’s odd, because I would’ve assumed they deal with a lot of snow here. Turns out that's not the case. I’ve been told the area only has one or two snowfalls a year. I guess it has something to do with the nearby mountains. Being a hardened Clevelander, it didn’t seem so bad to me. But, believe me when I say, there was barely a soul downtown that morning. 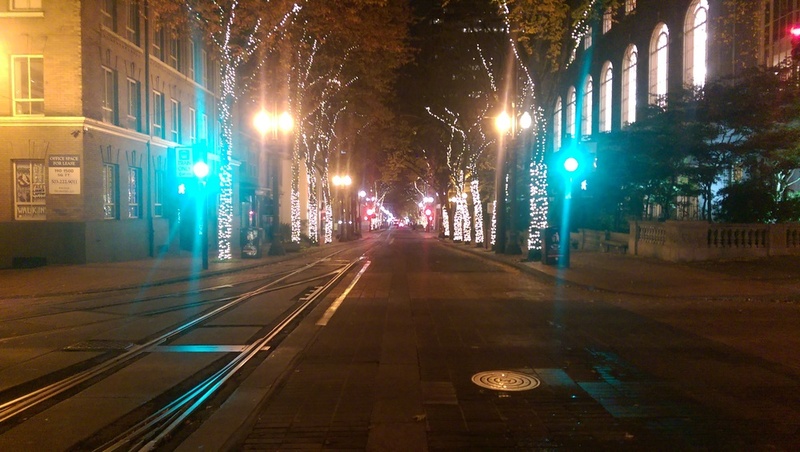 Which is a shame, because Portland is absolutely beautiful in the winter. Hell, this place is beautiful all the time. I guess that’s what it comes down to. So, I’ll end this blog by saying that I side with all Portlandians who want to ensure it stays that way. P.S. — I did an early morning hike through MacLeay Park on Saturday and for the record, I didn’t get lost this time. I’ll go ahead and chalk that up as a victory.